I’m glad to see a new opponent, that’s for sure. Jason Hammel, one of a bunch of more or less interchangable, cheap, back-of-the-rotation guys the Devil Rays have been juggling (and who I traded to Jason in our hyper-complicated keeper-league-of-keeper-leagues), faces off against Jeff Weaver, who’s been getting cuffed around since that pretty good August 12th game against a weak White Sox team. Weaver makes approximately $8m more than Hammel. Not playing: Adam Jones. Apparently, there is no way to play yourself into the lineup under McLaren: there’s no playing time to be had if you don’t perform up to an undefined standard, and spectacular performances are only rewarded with continued playing time if you’re a veteran. How is this supposed to motivate anyone? So THAT’S what a sucky bullpen looks like. Why is Yuni still batting #9? I havenâ€™t understood that for some time. There’s an argument for having speed on the basepaths ahead of Ichiro (you can’t bat him behind Ichiro because he hacks too much). And 9th doesn’t necessarily mean “worst” — some NL teams actually have had the pitcher bat 8th, to put a Betancourt-like hitter in the 9 slot for the same reason. You knew when that ball took that ridiculous hop on Harris, something like this would happen. I hate this team sometimes. The bullpen holds them back so much. 131 – Any chance anyone knows what that comics says with Weaver. I am really curious to know, even though I am sure its parodying his Weaverly performances. Cue was right. Unless you were stacking it up behind other tracks on your iPod. Putz on two nights back to back. This must feel strange for him. Like some kind of happy memory from long, long ago. Meaningless or not it’s still good to see them win. I dare say, if we win 16 of our next 17 we may have a shot. Umm, yeah, not happening. After tonight’s win you can rest assured that you won’t see Adam Jones get more than 3 ABs for the rest of the year. nice to hear RRS on the radio, but dang I still miss Snelly. Krueger is suggesting that RRS pitch instead of Weaver next time. Well, he can certainly go as many innings as the M’s starters have been managing lately. And if he can’t give a quality start, there’s always RRS in the bullpen to eat up innnings…. oh, wait. 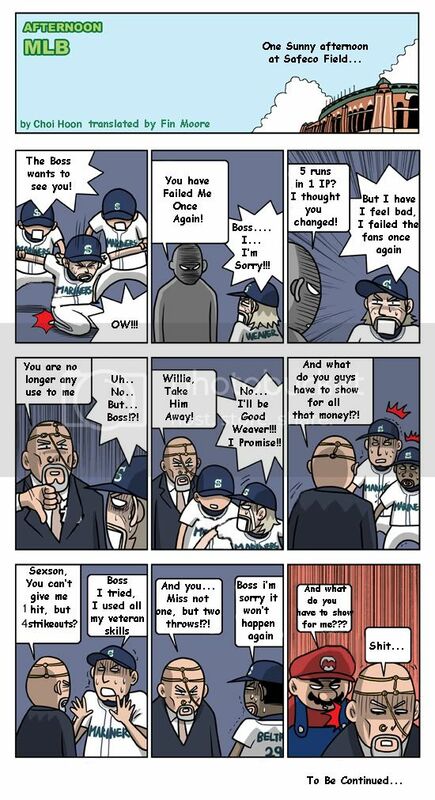 Every time I see HoRam start I wonder how bad of a pitcher Willie Bloomquist could be. Weaver made me think that tonight too. Given how many game-winning hits Yuni’s had in the 9th hole, I’m not sure I’d argue with it. Would he really have any more elsewhere? Ichiro has earned a chance to start a game on the mound for this team. per JJ, not realizing it was RRS’s first win, he gave away the game-winning baseball and so had to get the ball back from the kid (trading him another ball, and a Beltre-donated bat), then he missed his chance to pie Ryan during his radio interview, and so (alerted by EOF) was forced to race out in his skivvies to catch RRS during the FSN stand-up. It’s a hard job being the closer. Anyone recall that song “Never Surrender” that was in some Van Damme movie back in the late 80s or early 90s? That song should be played at the end of every M’s home game, even after they’ve been mathematically eliminated. I would think “The Final Countdown” would be more appropriate for this squad. 269: I see your point, but I guess my answer is because nothing about Yuni’s stats indicate that he’d be good in a high-rbi slot (which is where you’d otherwise want you’re game-winning RBI guys to be), and he’s been great in the ninth hole so why change it. But I do see your point, and now that I think about it, I could see Yuni batting a couple slots up. Or even 2nd if he’d stop popping up so much. By the way, I haven’t read the thread much tonight except for the later posts, and I only saw a few innings of the game, but what do folks think about tonihgt’s lineup? Aside from Willie, and aside from the fact that Jones should have started, and aside from Yuni batting ninth, and aside from the fact that the lineup sucked through much of the game, I liked it. I like sliding Vidro down to six and Beltre at two. Ichiro and Beltre are the only two M’s regulars I truly enjoy watching hit these days. But now I’m also excited about catching glimpses of Jones, Clement, Balentin, etc. I would think the Benny Hill theme would be more appropriate at this point (tonight aside). I just thought “Never Surrender” would be a nice bit o’ sarcasm that some fans would appreciate. Though Beck’s “Loser” might be more appropriate. Ok just one more time, sorry. Ok, sorry for wasting comment space, but clearly it seems i can’t post images directly here, sorry guys. You know… Jones had a 3-3 record with a 2.71 ERA as a pitcher in his senior season at high school. Though Beckâ€™s â€œLoserâ€ might be more appropriate. From the stands, RRS looked really, really good tonight, though it was probably the Rays hacking lineup combined with watching Weave and White before him. Regardless, he threw 94 at times and struck out 5 in just 2.1. Might he be a good starter someday? The “magic number” (elimination number) for the M’s is 9 for the division title, and 12 for the wild card. 17 games to go, 4 head to head with LAA, 10 in Safeco, all on the West Coast. It’d be nice to see more results from the NYYs like last night, with Toronto basically doing the same thing the M’s did. For the WC, Detroit is 3.5 games back, the M’s 5.5 games back.